In 1978 Newbold Revel a Catholic Girls school near Rugby run by the Sisters of Charity of St Paul closed down. The head, Sister Joan Thornhill and several other nuns moved into our parish and the house previously occupied by Mr Murphy, head of the school became a convent, the garage being converted into a chapel where the Blessed Sacrament is reserved. The pipe organ from Newbold Revel was dismantled and rebuilt in our church to replace the Electric Hamond organ that was always breaking down. We also had a quantity of ‘Daily Missals’ from Newbold Revel which were in daily use until recently replaced by books of a later edition and better condition. 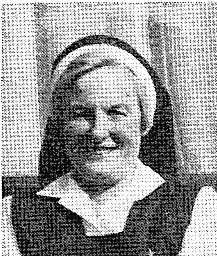 Sister Joan Thornhill died on 7th. January 1987. The Convent was closed in 2015.